We have the gorgeous Jenny over at Sephora’s Beauty and the Blog to thank for tipping us off to this website, which has quickly become our latest obsession: MopShots. 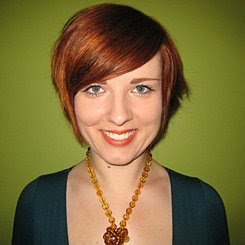 The site features photos of real women (like the cute redhead above who is all dressed for St. Patty’s), and lets you in on where they got their haircut and who styled it. Love that you can search by city, hair type, length and even color! We’ll definitely be using this site next time we head to a strange city and need a blowout! Here’s a QVC exclusive you won’t want to miss: Tarte Glow Your Way to Gorgeous…. Jane Iredale fans who live in NYC will want to dine at Serafina on E….